i love a good summer salad. 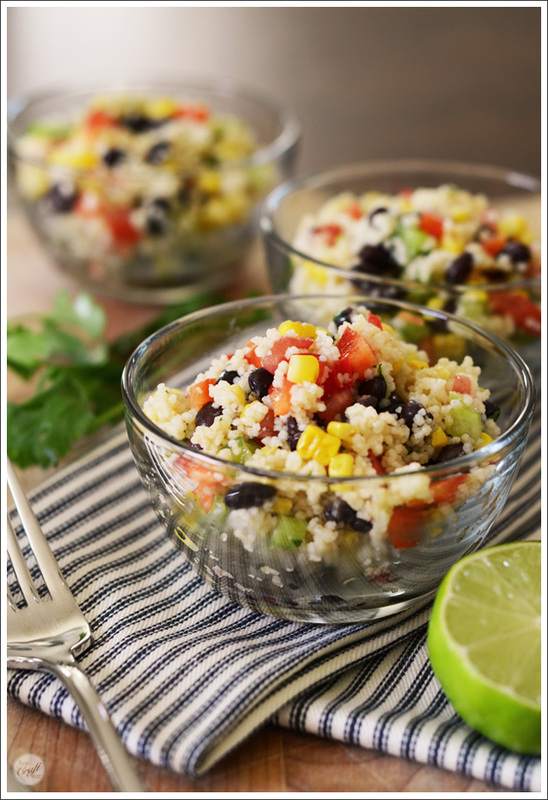 this southwestern couscous salad is great for summer because it uses a lot of fresh ingredients and is a cold salad which makes it so refreshing in the summer heat and goes great with other summer favorites like barbecue! 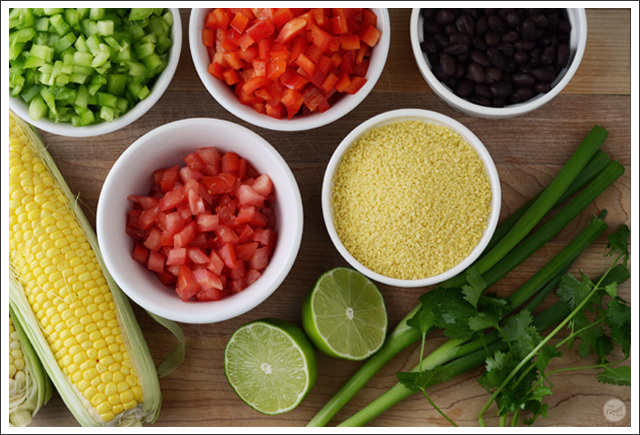 it’s also a cinch to put together – with a few chopped vegetables and cilantro, some grilled corn on the cob (or canned corn if that works better for you! ), and a simple dressing, it’s probably the easiest thing you’ve ever made. not to mention that aside from boiling a small amount of water for the couscous, there’s zero cooking going on in your kitchen! that’s my kind of summer cooking! -couscous is a lot like pasta. in fact, it’s made from semolina, which is the type of wheat that is used in making pasta. so in a sense, you could really just consider couscous to be a sort of coarsely ground pasta. 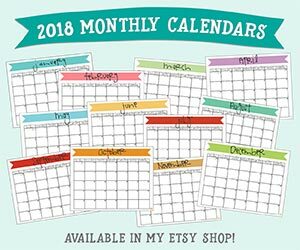 -it originates from northern africa, and while the original process is pretty labor-intensive, we’re fortunate to have the instant variety, which you can buy at any grocery store in a box, and which simply involves steaming or re-hydrating the couscous, a process that only takes a few minutes. 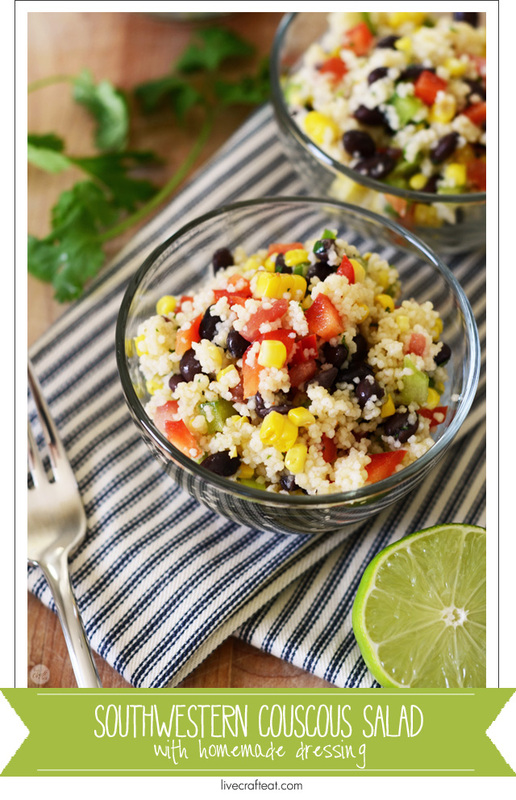 -also much like pasta (and rice), couscous doesn’t have much of flavor on its own, but it is great at absorbing flavor and is commonly used in salads (like this southwestern one we’re making! ), or stews, or any other meat or vegetable dishes (any recipe where you use pasta or rice as a bed for serving your main dish, couscous would probably work well, too!). it’s super versatile! -it’s good for you! an added bonus for sure. it’s got lots of protein, vitamins, and minerals. here’s a site that breaks down all the benefits of couscous, if you’re interested: why you should eat this high protein, versatile pasta-ish food. so i’m pretty excited about making even more recipes with couscous! but first, let’s keep going with this great salad recipe we’ve got going on here, shall we? 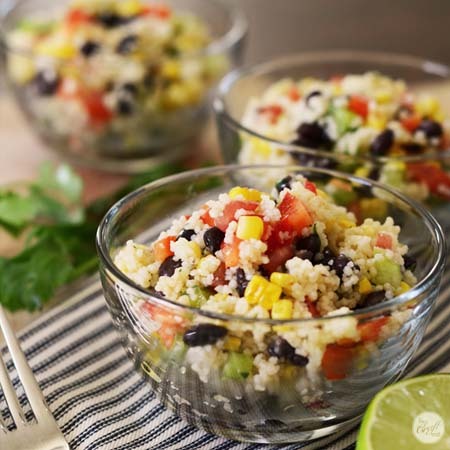 after getting the couscous steamed and fluffed with a fork, all you need to do is add everything else – the chopped vegetables, grilled corn, black beans, and the dressing. 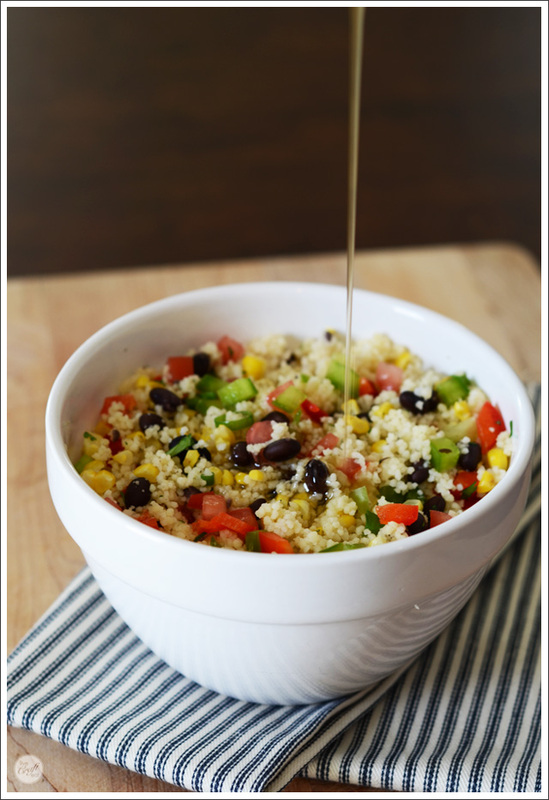 mix it all together in a big bowl and refrigerate for a couple of hours so that the super flavorful dressing can make its merry way to all of the couscous to give you a flavor-full salad. serve with extra cilantro and a squeeze of lime, if you’d like end enjoy a yummy, healthy, and refreshing, and colorful summer salad! here’s the recipe, y’all! enjoy! to prepare the couscous, boil water in a saucepan then remove from heat. immediately stir in the couscous, cover, and let stand for 5 minutes. fluff with a fork and let cool completely. combine the couscous and the remaining salad ingredients in a large bowl and toss to combine. in a small jar with a lid, combine all the dressing ingredients and shake well. pour the dressing over the salad and toss to coat. cover, and chill for at least one hour before serving. enjoy! I LOVE this recipe. So refreshing and yummy. I could even eat it as a meal!